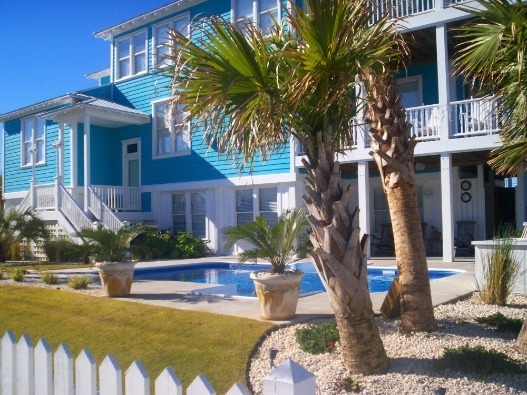 Kure Beach, North Carolina Find Kure Beach Vacation Rentals. Kure Beach, NC is located only 3 miles south of Carolina Beach, North Carolina (center to center), basically merging together. The town is part of New Hanover County. The population of Kure Beach is 2,063. Kure Beach is sometimes referred to as a “sleepy beach town” that is growing in popularity and price! While there is a permanent population of approximately 1,500 residents, the town still functions like any normal town with municipal services and fire protection. The town features a few restaurants, but no commercial entertainment… it’s the perfect place to get-away. Or stay if you love the slow pace of life! Kure Beach doesn’t have the option to expand as it is completely surrounded with the Fort Fisher State Recreation Area and Historic Site, US Government owns the west side, Carolina Beach borders the north, and of course the beautiful Atlantic Ocean forms the east border. Oldest Fishing Pier in NC – Kure Beach Fishing Pier Kure Beach History The town began development in the 1870s by Hans Anderson Kure from Denmark. However, the town was not incorporated until 1947. Kure Beach is majorly residential with modest cottages and some newer upscale houses. There are very few tall buildings in Kure Beach and new buildings may not exceed 35 feet in height. Since the late 1940s, the town has remained residential. Kure Beach holds a rich history as home to historic Fort Fisher – a confederate fort during the American Civil War. SeaWatch is right amidst the heart of Kure Beach and is a bright and fun community with oceanfront homes for sale, as well as water and sound views. This boutique community is private and independent, mostly owner occupied. It is family-friendly, with a pool, tennis courts, and private beach access – SeaWatch has just the right blend of privacy and community. With an active HOA, activities and events are posted regularly on the SeaWatch HOA’s Facebook page here. Whether it be the colorful houses, or the well-kept landscape, SeaWatch Community is sure to catch your attention. Victory Beach Vacations manages many of the homes for monthly leases in winter and weekly in summer. Kure Beach and nearby Attractions include Fort Fisher Fort, Fisher State Recreation Park, NC Aquarium, Kure Beach Fishing Pier, Ferry Ride to Southport, NC, Ocean Front Park, and more.